Pycnogenol benefits are among the most well-researched among nutritional compounds. My personal experience of this compound is remarkable. Shortly after my first 50 milligram dose, I felt a mild flush - a bit like a niacin flush, only more subtle. Gradually I increased my daily dosage to over 200 milligrams and began noticing a lovely tingle of increased circulation all through my body to my very fingertips and toes - even hours away from taking it. Excellent circulation is one of the cornerstones of health. 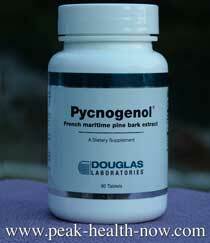 Pycnogenol benefits include a variety of ways that it supports the circulatory system. As we age, our microcirculation (capillary circulation) decreases. Slowly, capillaries get blocked by coagulated blood cells, and tissues fed by the capillaries are subject to 'micro-strokes' - lack of blood supply resulting in cell death. Part of aging is this cell death happening more and more. Aging is gradual death on a microscopic level. Since every cell in every organ and body tissue needs abundant vascular support to be fed, cleansed and healthy, decrease in capillary integrity equals getting old! 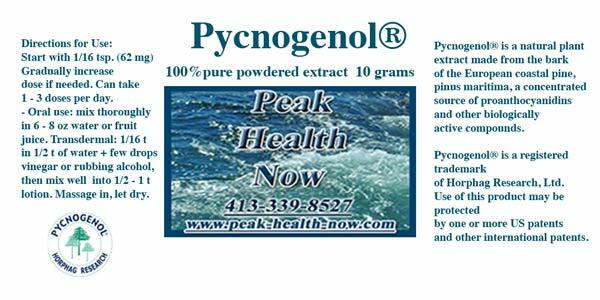 Pycnogenol® benefits to circulatory health are many and documented by reputable research. 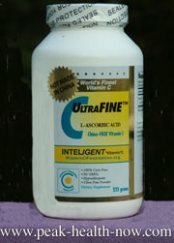 Because collagen, elasticity and tissue strength and integrity is ALSO supported by this compound, it follows that it supports the strength of blood vessels, valves, heart and other tissues of the circulatory system. The anti-aging support provided by genuine French Maritime Pine Bark Extract would be important if the above was all it did - but there is MUCH more! 15 clinical studies with total of 784 patients showed high level of Pycnogenol® benefits for venous insufficiency. By sealing leaks and increasing flexibility in brittle blood vessel walls, it seals the walls and stops leakage of blood into surrounding tissues. This solves the problems of swelling, micro bleeding and edema. Venous insufficiency can become a serious, chronic and complex condition, chronic venours insufficiency (CVI) - leading to ulcerations and other complications. A German double-blind study with 40 CVI patients showed Pycnogenol to be more effective at lower dosage than horse chestnut seed extract. Deep Vein Thrombosis (common on long airplane flights and other lengthy sitting) was also studied. Rate of ankle swelling in 169 passengers on 7 - 12 hour flights showed approximately half the rate of ankle swelling in passengers supplementing with genuine French Maritime Pine Bark extract. Another study of 211 airline passengers on a 7 - 12 hr flight took 200 mg Pycnogenol® 2 - 3 hours before flight and 200 mg 6 hours into the flight, as well as 100 mg the day after arrival. While 5 people in the control group developed thrombosis, NONE of the passengers taking the supplement developed thrombosis. 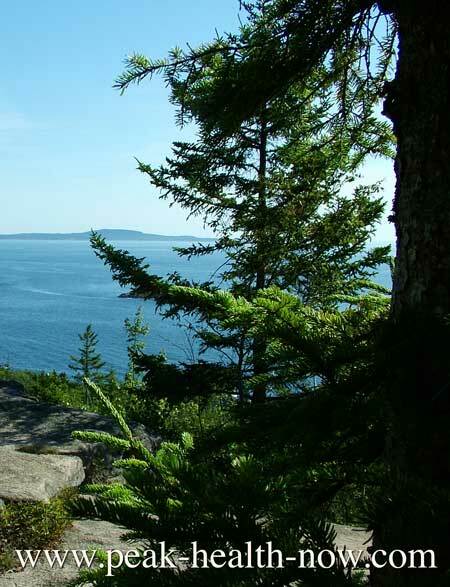 Firstly, this French Maritime Pine Bark Extract is taken from pines in a relatively pristine area away from pesticides and other environmental toxins. Second - NO toxic solvents are used in obtaining the extract. Research shows that Pycnogenol® is effective for controlling platelet activity and preventing blood clots - yet does not pose the danger that aspirin does of increasing bleeding time. This is a super-antioxidant - helps ALL other antioxidants to persist longer in the body. It binds to collagen elastin to keep our tissues strong. Helps us better utilize Vitamin E and Vitamin C.
Improves endothelial function (endothelium is the layer of cells lining the blood vessels). More Nitric Oxide production. Nitric Oxide (NO) is a vasodilator which means it relaxes blood vessels so they open and more blood gets to every organ and tissue in your body, supporting better health. NO is well-known to support better erectile potency in men and sexual response in women. 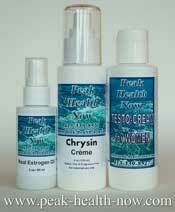 Improved endothelial function means a healthy circulatory system and helps prevent arterial narrowing. Nitric Oxide is anti-inflammatory - therefore keeps blood vessel walls strong and flexible. Healthy endothelial function also directs blood flow where it is most needed - for example to the muscles during exercise.